Sayraphim Lothian with Rachel Hughes’ bald calico dolls that are part of the Totem installation. More than 120 artists’ dolls will soon be on display at Federation Square, writes Frances Atkinson. THERE ARE TWO Sayraphim Lothians. One has pale skin, shiny hair and large eyes, the other has shiny hair, large eyes and pale green fur. “I’m so happy with it,” the real Lothian says, gently stroking the little monster’s hair. The furry doll is part of Totem, an installation made up of more than 120 dolls that will fill the hollow walls of the atrium at Federation Square as part of the Melbourne Fringe Festival. Lothian approached artists from Australia and around the world and asked them to create a doll with soul – a piece that “reflected their inner identities”. A few found the question so personal they couldn’t commit to the project, but many others found the idea of creating a doll that embodies some aspect of themselves an irresistible challenge. “Which is basically what most artists do to prevent working in call centres.” Lothian also worked as a puppet technician on Spike Jonze’s yet-to-be-released film Where the Wild Things Are, based on Maurice Sendak’s classic children’s book of the same name. At her headquarters, the Auspicious Arts Incubator in Southbank, Lothian’s studio resembles a surreal mail centre where packages in brown paper and bubble wrap of assorted sizes take up every inch of space. There’s a Frida Kahlo-inspired skeleton, a traditional-looking doll with a fabric cigarette hanging from its mouth, a brightly coloured, papier-mache doll featuring Andy Warhol’s face. The latest arrivals are on the desk. One is a small sculpture of a rabbit with large belly, protruding front teeth and what Lothian suspects are real whiskers. It hangs on to a smaller bunny doll, in the same manner a toddler might grasp a favourite toy: upside down, by one leg. Lothian said the artist, American Carisa Swenson, was initially worried Australian audiences might not like the doll because of our prejudice against rabbits and the damage they can do to the environment. Lothian doesn’t really know what Swenson is trying to convey with her doll, but adds, “I’m fine with that. I don’t try and interpret them too much.” But, she adds, “all art is personal because it comes through this filter of their own experiences”. Of course, dolls don’t always equate with sweet. In his book A Room Full of Toys, Alberto Manguel observes, “The body of a doll is always slightly disturbing.” He might well be talking about a piece submitted for the project by Melbourne artist Jon Beinart entitled bubbapilla – a stack of five headless baby dolls which are connected with only one head at the top. With each set of arms and legs pointing to the front, it does resemble a bizarre baby/caterpillar hybrid that is undeniably strange and beautiful. In contrast, artist Madeleine Hoxley drew on her science background to create a free-form quilted skeleton that’s anatomically correct. Black stitching provides the shading while caffeine-coloured fabric helps promote a creamy, bone-like pallor. One of the most captivating pieces is by American artist Beth Robinson. Her doll, about 45 centimetres tall, is a woman wearing a dress made from vintage fabric. She has long, dark hair, a hank of Robinson’s own locks, and four arms. One set reaches up to her head in despair or frustration, the other holds tiny dressmaker’s pins and a black voodoo doll. Her eyes are entirely silver – sightless and watchful at the same time. While some of the pieces are as far removed from a prosthesis-coloured Barbie or pimped-up Bratz doll that you can get, many are influenced by traditional doll-makers. Lothian said she was inspired to create Totem partly because of her own childhood connections with dolls. Melbourne artist Jade Burstall is making a documentary about Totem that will run on a large screen during the exhibition. “‘I’m not a crafty person but I got on board because I was drawn to the idea of dolls with souls. The installation process will take Lothian two days to complete and Burstall plans to capture much of it on film. 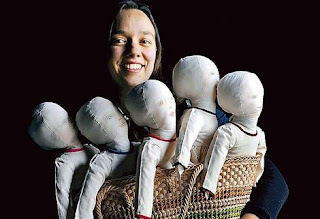 The project has also inspired debate between artists about the nature and craft of making dolls, and the process of transformation that turns a doll into a work of art. Lothian believes environment has a lot do with it. The Age is a sponsor of the Melbourne Fringe Festival. I got very excited when i saw it in the paper this morning.